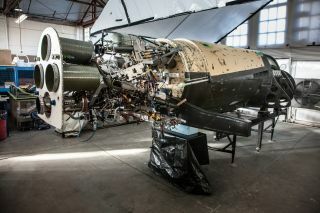 XCOR Aerospace's Lynx space plane under construction in late 2014 at the Mojave Air and Space Port in California. One of XCOR's founders, Jeff Greason, talked with Space.com about the status of the spaceflight industry. The future of private spaceflight looks bright to Jeff Greason, co-founder of the private spaceflight company XCOR Aerospace. But there are still some big challenges ahead before talking a spaceflight is as easy as a commercial airliner trip. XCOR is currently working to build the Lynx space plane, which would take customers on a trip into suborbital space, where they could experience weightlessness and see the Earth from over 60 miles (96 kilometers) above the surface. Other companies including Blue Origin and Virgin Galactic are also working on suborbital space-tourism vehicles. Greason recently announced that he is leaving XCOR, but told Space.com he is not leaving the spaceflight industry. We caught up with him at the SpaceCom Expo in Houston to talk about commercial destinations in space and when space vehicles will be more like cell phones. Space.com: So XCOR and other space transportation companies want to sell tickets aboard their various space vehicles. How are you monitoring the potential market for commercial spaceflight? Are there enough people who want to pay the money to take these trips? Jeff Greason, a cofounder of the private spaceflight company XCOR. In fact, XCOR raised their prices recently just because the market would bear it. We didn't assess that the market was going to be much smaller in volume if we set a higher price point. Obviously, many people will wait to make those purchases until service actually begins. But I think for the suborbital market, the demand is strong. [Suborbital] is a worthy market in its own right, but it's also interesting because that's a feeder market for orbital transportation, as well as being a technology proving ground for orbital transportation. And that's where you start talking about things that are truly game-changing. Space.com: Do you think that people who buy a ticket on a suborbital flight will buy a second ticket? In other words, will the market continue to have a steady stream of customers, or will they go away after they take their first flight? Greason: I think there'll be some repeat customers. In my own experience — this is not a scientific survey — people who are buying tickets in advance for suborbital flights are doing so [because] by being an early adopter they're helping push the technology forward. They're not doing it because [it] would be fun. There's a component of [fun], but they're doing it because they know that if people hadn't bought $10,000 flat-screen TVs nobody would have one today. If people hadn't bought $5,000 cell phones nobody would have one today. They're people who have dreamed of spaceflight for a long time, they want to see spaceflight really happening. They're aware that by being one of the pioneering customers they're helping to make that happen. Once [commercial spaceflight is] actually happening, it'll be a different market dynamic with a different group of people. Space.com: One thing people are talking about at this meeting is having destinations for people who buy a ticket on a commercial space plane. So, things like space hotels or a moon base or something. Are transportation companies like XCOR interested in building those destinations, or are there other companies doing that? Greason: I think it makes sense for destinations to be done by other people. But there are plenty of other people who want to do the destinations and are waiting for the transportation. There's Bigelow. [Ed note: Bigelow Aerospace has some very interesting plans for space habitats, including an inflatable space room for astronauts on the International Space Station.] And there are others. If anything, I think the destinations are more ready for the transportation than the other way around. I don't think it would make a lot of sense to make a reusable orbital system that wasn't optimized for going to destinations, because otherwise you'd have to carry your habitat with you, it would make the ship bigger and more expensive — and I have no doubt that destinations are going to happen. Space.com: There are some very exciting things happening in commercial spaceflight, but part of me wonders if the industry will "take," so to speak. I mean, could it totally fail and the dream of people being able to buy tickets to space totally dry up? Greason: With commercial space, everybody always comes to it as though this were a brand-new thing. This started in the 80s and it's certainly had its peaks and its valleys, but every peak's been higher than the last valley. And so every wave gets farther up the beach. But we have not yet reached the point where I think it's irreversible. Now, I still think if we don't make it in this crest, we will make it in the next one. The enterprise is much bigger than just the transportation segment. But it's all enabled by the transportation segment. So if the transportation's not there, then all of the other great things we can do, which make up much more of the business, can't happen. So transportation is key. The point of no return on transportation comes when the profits from space transportation are sufficient that you can fund the next-generation, improved product out of the profits from the current generation, without having to go back to capital markets or go back to government agencies and asking permission to improve the product. That's what every other technical area has. You people don’t go and petition Congress for next-generation cell phone technology, because they make enough profit from the current generation to make the next generation. Same with computers, same with cars, same with everything like that. [Commercial spaceflight isn't] there yet. The volume of spaceflight is still too small to make current space traffic sufficiently profitable to get into that cycle. But we're getting closer all the time. And it's possible that the emergence of the new, smaller satellite markets, plus the addition of commercial human spaceflight as a market, might have enough volume that a suitable vehicle or vehicles can be profitable. We haven't demonstrated that yet. So, I'm very excited about the progress that's going on. We're certainly way farther up the beach on this wave than we were on the mid-2000s wave, or in the mid-1990s wave, or in the initial spark in the 80s. And every one of these waves, even if there is a peak or a bubble, every one of these we come out of it with more people who have more real experience working on real space hardware under commercial conditions, that provides the nucleus for us to get further up. So it's all good. But no, it's not a smooth march to victory unassured or without risks. We could be there now — I hope we're there. And if we're not there now, we'll be there next time. But we're not done. We're very near the point where it stops being a series of oscillating waves, and starts being exponential growth. But whether this one is the last wave or not, I don't know yet. I hope that we cross the threshold. If things keep going like they're going for a few more years, we probably will.